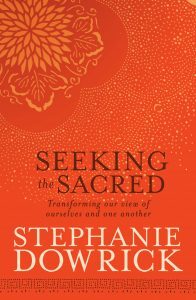 Stephanie Dowrick offers uplifting inspiration and social commentary through her books, articles, “Official Stephanie Dowrick” Facebook page, and as co-host of the new Universal Heart Book Club. She has been contributing to public discussion on issues that matter since she came to Australia in 1983, and was “Inner Life” columnist for Good Weekend Magazine from 2001-2010 (Sydney Morning Herald and the Age). Some of her most popular articles were collected in Free Thinking. Many more were extended for her recent success, Everyday Kindness. She is a regular guest on ABC Radio, an occasional contributor to both the Sydney Morning Herald and the Age, and an active blogger. Dr Stephanie Dowrick is currently an Adjunct Fellow with the Writing & Society Research Group at the University of Western Sydney, where she also completed her research doctorate in 2008.